My work day is probably similar to most of yours. I have good days and bad days. I have days that are challenging, like the landscaper who had a small thorn on the back side of his upper eyelid (which I successfully removed). Or the patient last week who had a vitreous hemorrhage (the inside of his eye was filled with blood). But, despite these and other emergencies, many days are routine, and I find myself talking about the same ol’ stuff. Here are a few discussions I have almost daily. Will wearing glasses make my eyes worse? For most people, the answer is no. And for those who are in their 40s and having trouble with near vision, the answer is definitely no. As I point out to patients who are getting their first pair of glasses, you can’t blame your blurry vision on glasses because you never had them before! Are carrots good for my eyes? Yes, they are, as are all brightly colored fruits and veggies. Although they have no effect on nearsightedness or farsightedness, fruits and vegetables are good for eye health and prevention of conditions such as macular degeneration. However, if I could make a small change, I would argue that spinach, or other dark green leafy vegetables like kale or collard greens are better than carrots because they are rich in lutein and zeaxanthin. What is a cataract? Everyone has a lens inside their eye that is positioned just behind the iris. The lens is crystal clear when we are young and starts to get cloudy as we get older, causing a very gradual decrease in vision and increase in glare. In fact, this process starts in your mid-40s, but the rate of progression is not the same for all. When the symptoms start to impact your life, the cloudy lens will be surgically removed and a brand-new, clear lens will be implanted during a safe, 15-minute procedure. And, no, these age-related cataracts are not hereditary. Is it OK to sleep in contact lenses? Although some of my patients safely sleep in their contacts, they are doing so under my supervision. For most contact lens wearers, I do not recommend it. The cornea needs oxygen to stay healthy, and when the eyelid is closed while we sleep and a contact lens is in place, the cornea does not receive much oxygen which can lead to problems. And while I’m on the subject, stop hoarding contact lens cases, always use fresh solution when storing contacts, dispose contacts as directed, don’t buy colored contacts in a nail salon or tattoo parlor, and it is not a good idea to wear your friend’s contacts! Have fun with this one. I see 10. Baa Baa Black Sheep is also the same tune. 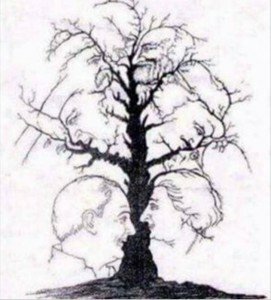 I see 10 faces and 1 owl. How cool!!!! I see 11. I see 10 too! How cool!